After much success in Baseball and Basketball, the hobby-favorite Bazooka comes to Football. And why is the product loved by collectors of all ages? Maybe it's the 3 Relic Cards, 48 Parallel Cards, 4 Tattoos, 6 Quad Stickers and 6 Comics guaranteed in EVERY BOX! On top of that - it's a $1.99 per pack and it has GUM! The 220 base-card set features 55 Rookies and 165 of the NFL's top veterans. The set is also mirrored by 2 full parallel sets - Bazooka Minis and Bazooka Chunks. Inserts include 33 Tattoos, 44 Quad Stickers and 24 Comics in the style of Bazooka Joe. (35) All-Stars - Topps Exclusive cards featuring actual pieces of 2004 Pro Bowl Jersey. (34) Originals - Includes the future of the NFL such as Eli Manning, Ben Rothlisberger and Kellen Winslow. (9) College Collection - Cards featuring pieces of college jersey from Carson Palmer, Anquan Boldin and more. 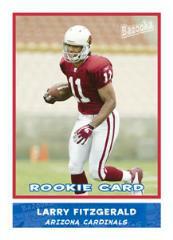 2004 Bazooka Football hits stores Sept. 1 and carries a $1.99 SRP for each 8-card pack.